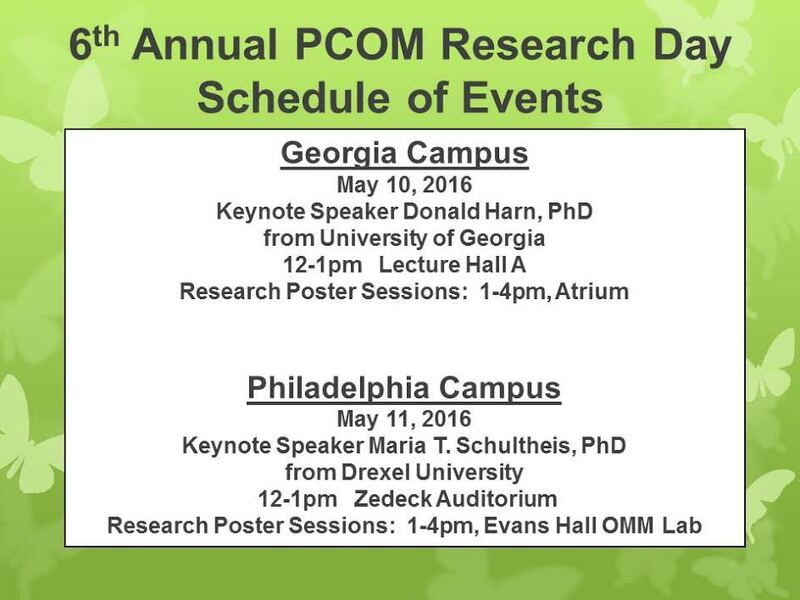 We are proud to announce the 6th Annual PCOM Research Days! All members of the PCOM community are invited to a celebration of Research, Innovation, Scholarship and Creativity with a day of poster presentations on the Georgia and Philadelphia Campuses, sponsored by the CCDA, the PCOM chapter of Sigma Xi, the National Research Honor Society and the Division of Research. Georgia’s poster session will be held May 10, 2016. The official poster competition will be from 1:00 pm – 4:00 pm in the Atrium. Judging will commence at 1:00 pm. The 6th Annual PCOM Research Day Georgia keynote speaker will be Dr. Donald Harn of University of Georgia who will deliver the keynote lecture from noon -1:00 pm in Lecture Hall A.
Georgia poster boards are 3 feet in height and 4 feet in width, so the posters will need to be a little smaller than the boards. You can submit the PCOM marketing research poster request form here. Alternatively, you can access a pdf version of the request form here. Philadelphia’s poster session will be held on May 11, 2016. The official poster competition will be from 1:00 – 4:00 pm in the OMM Lab of Evans Hall. Lunch will be provided throughout the poster session and judging will commence at 1:00 pm. Philadelphia poster dimensions may not exceed 4’x6’ (48”x72”).